David Bowie used to scare me when I was a kid, because he was The Goblin King, and that was the scariest thing ever. Labyrinth is another one of my favorite movies. I now have him stuck in my head. 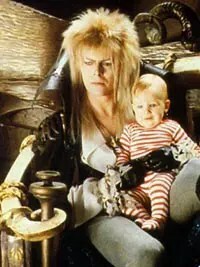 you remind me of the babe (what babe?) the one with the powers (what powers?) the powers of voodoo (you do?) you do! (do what?) remind me of the babe!